We are through 7 weeks which is a little over half of the regular season. Your Sweet Fantasy is switching things up a little this week. I’m bringing you 6 lists of 9 from the first half of the Fantasy Football season. These lists are compiled by yours truly and cover a range of things. Sit back, relax and enjoy. These are players that had outrageous weeks that won you the week by themselves. Several of these players could have been here multiple times. This list highlights players that are outperforming their draft position. Kareem Hunt – 1002 yards from scrimmage 25 receptions 6 TD. Depending on when your draft was, Kareem Hunt could have been as low as a 5th rounder. Todd Gurley – 920 yards from scrimmage 27 receptions 8 TD. Gurley was a 2nd or 3rd rounder in most drafts but is RB1 at the moment. Chris Hogan – 28 receptions 378 yards receiving 5 TD. Some people drafted before Julian Edelman was lost for the season. Hogan was drafted around the 8th Round post-Edelman injury. Alex Smith – 1979 yards passing 15 TDs 0 Interceptions 121 yards rushing 1 TD. Smith went undrafted in many leagues and is currently QB1 in most formats. Carson Wentz – 1852 yards passing 17 TD 4 Interceptions 196 yards rushing. Wentz was drafted as a QB2 by most Fantasy Football Players. Deshaun Watson – 1297 yards passing 15 TD 5 Interceptions 202 yards rushing 2 TD. Watson was on the waiver wire for several weeks. Adam Thielen – 43 receptions 539 yards receiving. Thielen was drafted after round 10 in most leagues. He is currently a Top 10 WR in ppr. Zach Ertz – 39 receptions 494 yards receiving 5 TD. The current TE1 could be had in the 7th round or later of most drafts. Jason Witten – 31 receptions 283 yards receiving 3 TD. The ageless wonder was drafted towards the back of most drafts. These are players with a high ticket price that have had their share of problems in the first half. Unfortunately, 1st round picks don’t have warranties. Injuries do not apply. Marshawn Lynch – 304 yards from scrimmage 2 TD. Many used a 3rd round pick on Marshawn. Jamison Crowder – 19 receptions 149 yards receiving 0 TD. The 5th or 6th round pick was dropped in many leagues. Isaiah Crowell – 395 yards from scrimmage 0 TD. “Crow” was drafted as an RB1 in many leagues. Martavis Bryant – 18 receptions 234 yards receiving 1 TD. Many expected a breakout from Martavis. He may be breaking out of Pittsburgh before the season is over. Matt Ryan – 1590 yards passing 7 TD 6 Interceptions. Matt Ryan was drafted as a Top 5 QB. Terrelle Pryor – 18 receptions 223 yards receiving 1 TD. It’s amazing Kirk Cousins is still putting up stats with Crowder and Pryor as his Top 2 WR. Jay Ajayi – 491 yards from scrimmage 0 TD. Ajayi’s stat line isn’t terrible but 0 TDs hurts the 1st round pick. Amari Cooper – 29 receptions 356 yards 3 TD. A huge Week 7 saved Cooper from a top 3 spot on this list. Joe Mixon – 333 yards from scrimmage 1 TD. Mixon was drafted in the first 5 rounds and has yet to breakout. These are players that have a big 2nd half in store. Mark Ingram – Mark Ingram is going to help a lot of teams go far in the playoffs now that Adrian Peterson is in Arizona. Amari Cooper – Cooper may have just had the best game of his career. For the Raiders to make a playoff push they will need to keep Amari involved. Doug Baldwin – Doug is no stranger to huge 2nd half performances. I expect him to heat up down the stretch, along with Russell Wilson. Jay Ajayi – Ajayi’s workload is starting to ramp up again. He should have a few 100-yard games down the stretch. Josh Doctson – Josh Doctson is going to be given every opportunity by Jay Gruden to be the top WR in Washington going forward. Evan Engram – Engram has already been great this year. He is the Giants only receiving option right now and should remain a TE1 the rest of the way. Aaron Jones – Jones has proven he is the best running back on the Packers roster. Derek Carr – Carr has some great match-ups in the second half. He is back to form. Hunter Henry – After few donuts early in the season, Hunter is now a huge part of the Chargers passing game. Kareem Hunt – 1002 yards from scrimmage 25 receptions 6 TD. Hunt is the RB1 in many formats right now. In a rookie class with lots of RB talent, he surpassed the Big 3 in his opening game. Deshaun Watson – 1297 yards passing 15 TD 5 Interceptions 202 yards rushing 2 TD. Watson is having an all-time great season at the QB position. He was free in most leagues. Leonard Fournette – 732 yards from scrimmage 15 receptions 7 total TD. Fournette may lead this list by season’s end. He is an old-school volume back that likes to inflict pain on the secondary. Dalvin Cook – 444 yards from scrimmage 11 receptions 2 Total TD in only 4 games. Cook was done for the season after 4 games but I had to put him in this spot. He will be a great fantasy RB for a long time. Evan Engram – 30 receptions 342 yards receiving 3 TD. Engram is having a Top 5 season at the Tight End position in his rookie year. That is unheard of. Christian McCaffery – 443 yards from scrimmage 44 receptions 2 Total TD. McCaffery hasn’t been great as a runner but he is on pace for around 100 receptions. Cooper Kupp – 23 receptions 316 yards receiving 3 TD. This isn’t a great WR class but Cooper Kupp has emerged as the slot receiver on a surprisingly high powered Rams offense. Tarik Cohen – 454 yards from scrimmage 27 receptions 1 TD. The receiving back was a hot waiver pickup after Week 1. He has cooled off some but is still a decent flex play. Alvin Kamara – 424 yards from scrimmage 28 receptions 2 TD. Kamara has taken over the Reggie Bush or Darren Sproles role in Sean Payton’s offense. He has a nice floor in ppr leagues. This is a list of the Top waiver wire pickups of the first half. Chris Thompson – 579 yards from scrimmage 23 receptions 5 TD. Thompson has been the best receiver on the Redskins. If you picked up Thompson you got a Top 10 ppr RB for free. Deshaun Watson – 1297 yards passing 15 TD 5 Interceptions 202 yards rushing 2 TD. Watson is on a lot of my lists and that shows you how great of an impact he has had. Alex Smith – 1979 yards passing 15 TDs 0 Interceptions 121 yards rushing 1 TD. The QB1 in some formats was unowned in many leagues to start the year. Nelson Agholor – 24 receptions 366 yards receiving 5 TD. Agholor looked like a bust after 2 years. He has been Carson Wentz’s second option after Zach Ertz this year. Javorius “Buck” Allen – 444 yards from scrimmage 31 receptions 2 total TD. Allen’s pass-catching has made him an easy guy to start at the flex every week. Tarik Cohen – 454 yards from scrimmage 27 receptions 1 TD. Cohen was the free agent prize of the early season. The lack of a deep passing game in Chicago should keep him involved. Austin Seferian-Jenkins – 26 receptions 173 yards receiving 3 TD in 5 games. ASJ is an every week starter at TE that you grabbed for free. Jerick McKinnon – 368 yards from scrimmage 22 receptions 3 TD. Jerick McKinnon put together back to back 20 plus point games after the Dalvin Cook injury. Jared Goff – 1719 yards passing 9 TD 4 Interceptions 45 yards rushing 1 TD. Goff may still be available on your waiver wire. He is leading one of the top offenses in the NFL. I hope you enjoyed these lists. Next week I’ll hit you with another 69…things. I’m your Sweet Fantasy. 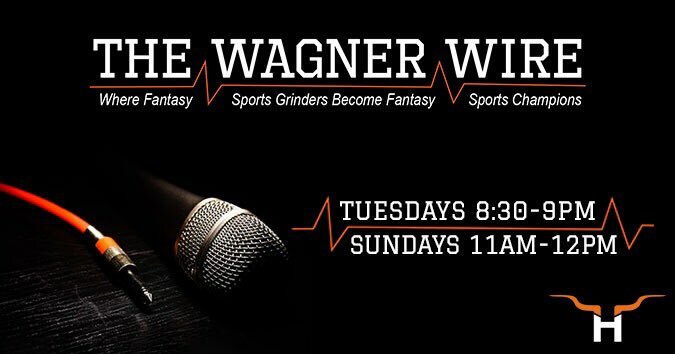 Don’t forget to listen to The Wagner Wire Live on Tuesdays at 9:30 PM EST and Sundays at Noon EST. Stream it live on hornfm.com or the 104.9 The Horn App.